Recycling an old T-shirt and leftover fabric scraps to make a memorable, one-of-a-kind tee. Do you have a favorite t-shirt that has a rip or a stain? Make it an original! Bring it back to life with fabric scraps from old sewing projects. 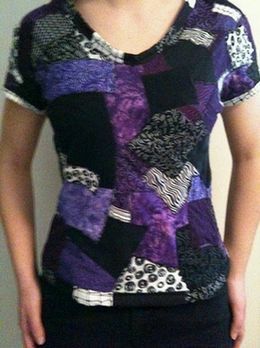 This Fabric Scraps T-Shirt is a great project to do with a teen. 1. Pick out your old t-shirt, fabric scraps (complimentary colors work nice or monochromatic: shades of one color) and thread (the thread can match your fabric or make it a different color for artistic interest). 2. Decide what size you want to make your fabric pieces. You can vary your sizes slightly to cover the old t-shirt. 3. You can make the t-shirt more fitted by bringing in the sides. You then lay the fabric over the old t-shirt and do zigzags. Keep overlapping one piece over the next until the whole shirt is covered. Make sure you go over the piece twice because this will help to make it stronger for wear and washings. 4. Make sure you cover the front and the back of the t-shirt. You can finish the ends by simply folding the piece under then sewing or make your own trim with the same scraps of fabric. You can then use it to trim around the whole t-shirt. 5. This may take a few days to make but you will imageshave fun turning an old t-shirt into an original design by you. Laura Koob is an original artist who has images of her work throughout the United States, Canada and Europe. She is a self-taught artist who works with painting, sewing and photography and has copyright images dating back to 1983. As an artist my artwork reflects my love for children, animals, and nature. My background in early childhood education allows me to envision the eye of a child. My goal is to open the world of art to children and adults.